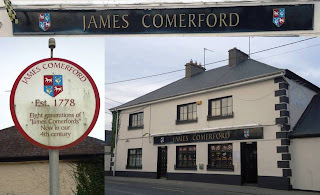 Recently, while I was travelling between Wexford and Dublin, I took a detour from the new motorway and followed the old road into Gorey in enthusaistic hope. I wanted to take a photograph of George Comerford’s butcher shop, which had stood at the north end of the Main Street for generations. Sadly, the shop now longer stands ... there was no photograph to take. I had passed this shopfront for years and taken it for granted. There and then I resolved to photograph any Comerford shopfronts and signs I see in the future. Here are some Comerford shopfronts and signs ... the photographs are not all mine, but I’m happy to post photographs taken by others. 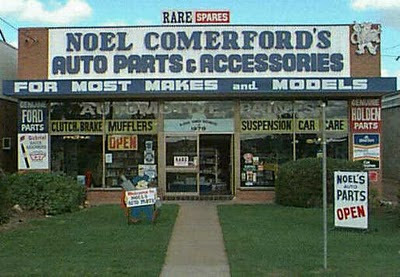 So, if you know of other Comerford shopfronts or signs or would like to see more photographs, please let me know. However, the property was then internally derelict and in need of major restoration, refurbishment or rebuilding. 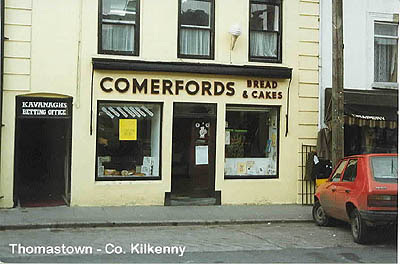 Full planning permission had been received from Kilkenny County Council to extend and alter the premises providing walkway access through the shop, alteration of the shop and the provision of offices on the first and second floor, resulting in a ground floor retail unit of about 1,000 sq ft, with frontage to Market Street and to the proposed walkway. 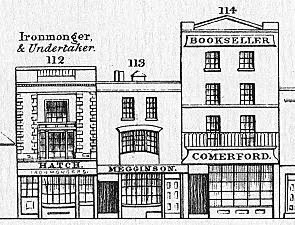 In the mid-19th century, a Comerford family were prominent booksellers in Portsmouth, with a well-known shop in High Street. 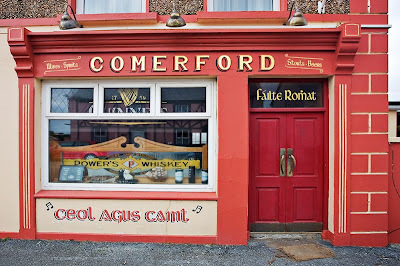 The Comerford shop was part of a block of buildings in High Street, Portsmouth, between the Governor’s House and Highbury Street, or St Mary’s Street, that are regarded as quintessential examples of Victorian shopping. This group of shops, from No 112 to No. 114, was illustrated a Charpentier panorama and in a drawing, probably dated around 1860. The drawing was commissioned by Comerfords, the booksellers, whose shop can be seen on the right, and is frequently used to illustrate a typical Victorian High Street – for example, it is used on the cover of Portsmouth Paper No 26, An Early Victorian Street. 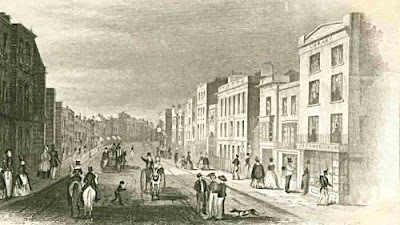 The drawing must be dated later than 1849 as the full image shows a horse-drawn bus further down the road and these were not introduced until that date, at the latest. There is also a similarity in presentation with a drawing of Cambridge Barracks that is dated June 1861. There was less than two decades between the publication of the two drawings, and so it is not surprising that all three structures depicted were not been materially altered in the intervening period. 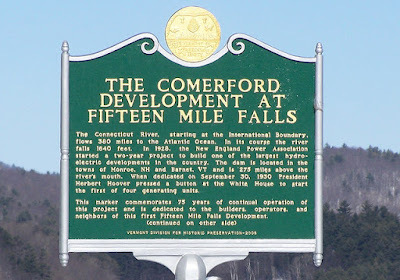 The company of Comerford & Dowd, Teas and Coffees, was operating from 106 Front Street, Worcester, Massachusetts, in the 1920s. 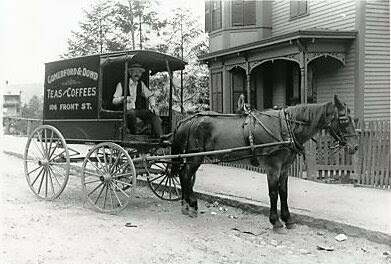 This vintage photograph of a horse drawn carriage owned by the company, was taken in Worcester, Massachusetts, and was used in an old postcard. Last updated: 5 February 2011, 3 March 2011, 23 April 2011, 4 July 2011; 3 May 2012; 2 March 2013. These are great Patrick, thanks for posting them! Is the blog still active? I'm an American Comerford cousin and wondering if anyone is still there? Yes Jeff, this blog is still active, and I update it regularly. If you wish to contact me, there is a link to my other blog, where you can find a direct link to my Facebook Page. There you can find further ways of getting in touch with me.